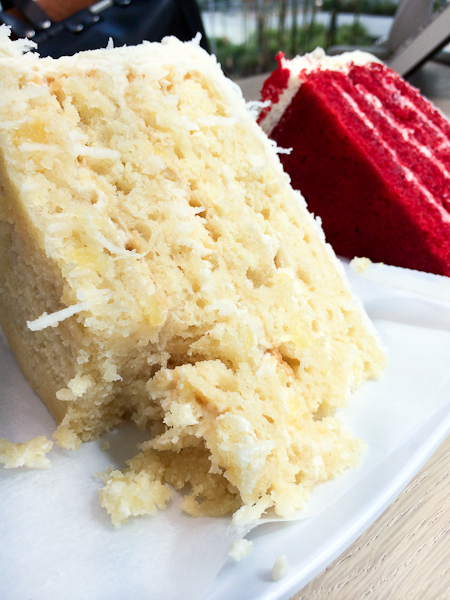 Happiness and cake go hand-in-hand and, now that California’s favorite bakery has arrived at Costa Mesa, it’s yours for the taking! Simply step into the all-American SusieCakes home-style bakery at its newest location at South Coast Collection (SOCO) in Costa Mesa and succumb to nostalgia. The new Costa Mesa space is a bright and homey haven with an old-fashioned glass bakery case and retro color scheme featuring “Susie Blue,” the brand’s signature color. Friendly counter service adds to the neighborhood bakery feeling and a large viewing window offers mouth-watering views into the kitchen as the culinary team puts the finishing touches on custom cake orders. These children were so excited and happy to be at Susie Cakes. How wonderful to work at a place where customers exclaim, “we’re sooo glad you’re here!”. The celebration cake (upper R) is the most popular item. A slice of cake is $6.25 and it is humongous! Cupcakes are $3.25. 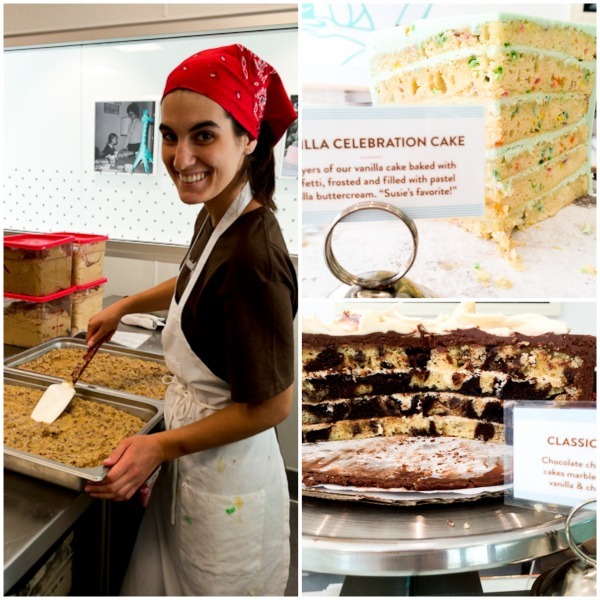 Founded by Susan Sarich in 2006, the company specializes in an array of sentimental dessert favorites based on Susie’s grandmother’s recipes and made from scratch with simple ingredients by on-site bakers. Coconut cake was my favorite cake mom used to make and when my hungry eyes ogled Susie Cakes’ towering version looking so fluffy and moist there was no going back. I absolutely had to try it. Let me tell you, mom was good, but this level of excellence can not be attained with a cake mix, sorry mom! 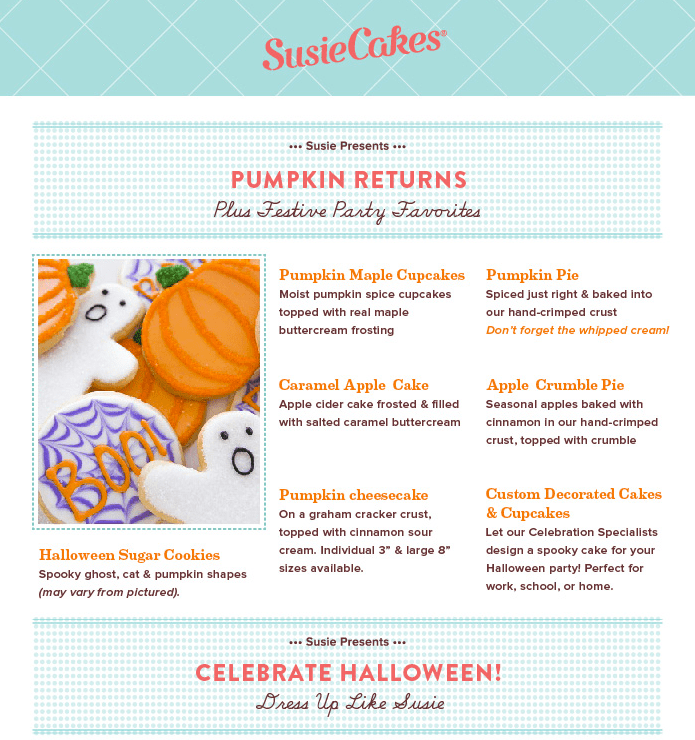 Susie Cakes’ specialties include decadent cupcakes and frosted layer cakes in familiar flavors such as red velvet, chocolate and coconut. Rotating seasonal offerings feature fresh fruit pies baked in flaky, hand-crimped crusts and holiday-inspired treats. A selection of classic cookies and bars includes soft and chewy snickerdoodles, fudgy brownies, seven layer bars and their famous whoopie pies. Fans of Red Velvet Cake need search no longer for crimson and cream cheese frosting perfection. Staying true to the heritage recipe means the brilliant color is derived from food coloring and there are no gluten-free or vegan derivatives – only the magical made-from-scratch homemade taste, high quality ingredients and friendly service which, as their popularity and expansion affirms, are a welcome alternative to the artificial flavors and preservatives found at most grocery-store bakeries. The German Chocolate Cake is the Best. Ever. 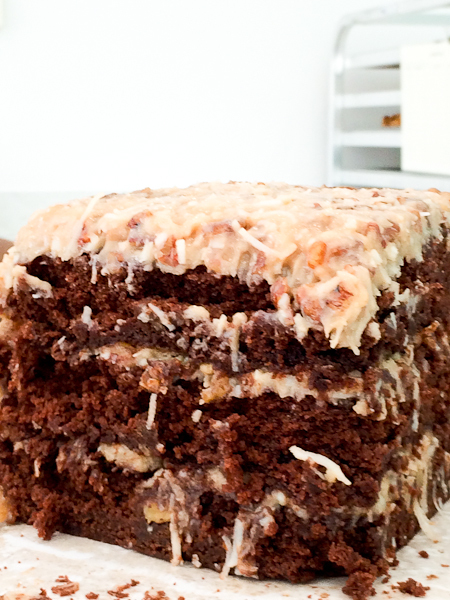 Just look at that gorgeous mess of chocolate, buttercream and coconut! I brought a giant piece of The Don’s favorite home for him and, in between bites of sheer joy, mischievous stories involving half sheets of cake unfolded. The first SusieCakes bakery opened eight years ago in L.A.’s Brentwood neighborhood. Locations soon followed in Calabasas, Newport Beach, Manhattan Beach and, just last month, Marina del Rey. Demand for the trademark home-baked taste isn’t limited to southern California, as Sarich satisfies northern California “SusieFans” with outposts in Marin County, San Francisco, Menlo Park and the East Bay as well. SusieCakes also offers the services of a Celebration Specialist, a cake connoisseur available for guests to work with to create their dream custom confection. Armed with an iPad full of photos for inspiration, the Celebration Specialist hosts complimentary tastings by appointment and guides guests on creating the perfect dessert spread for any celebration. Children’s birthdays, weddings and other special occasions receive a sweet touch with artistic, hand-decorated stacked cakes, cookies and cupcakes designed to match party colors and themes. Located at 3321 Hyland Avenue on the SoCo Courtyard, SusieCakes Costa Mesa opened its doors to the public on September 6th with a week-long celebration including a Saturday family fun day, cupcake happy hours and two-for-one slices of cake. So get happy and eat more cake! 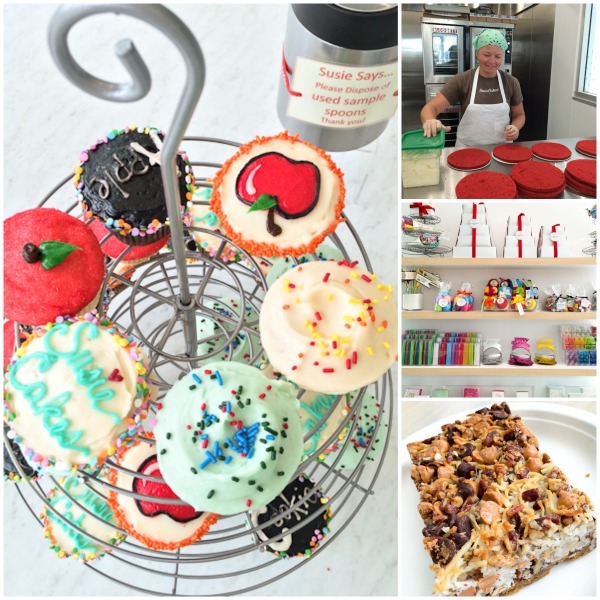 SusieCakes is sure to become a favorite stop for OC families visiting SOCO and the OC Mix. Open Monday through Saturday, 10am -7pm. 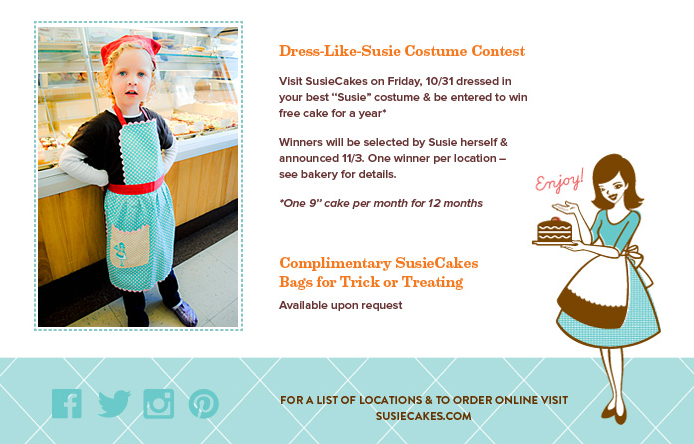 For more information, please visit susiecakes.com and Like their Facebook page to know about seasonal specials and contests. Note to South County residents – don’t be sad if you missed the Grand Opening festivities, Susie Cakes could be coming to your neighborhood in 2015!